Canola fertilizer management and rotation management have been hot topics this spring. We’re going back to the basics for fertilizer, with a review of the 4 Rs, and a description of the three most important goals with a canola crop nutrition strategy. The rotation article provides an overview of the science behind canola rotations and risk management. 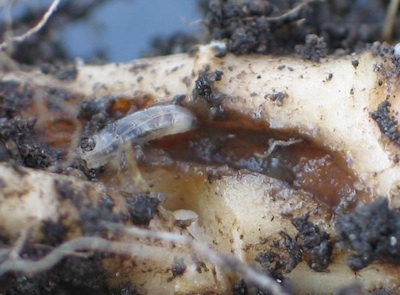 Increased root maggot damage (shown in the photo) is one of the risks from a tight canola rotation. More and more growers, agronomists and ag retailers are signing up for Twitter. Follow @CanolaWatch and follow the CCC agronomy specialists. Find their Twitter handles here. You don’t have to tweet anything to gain a lot from Twitter. Just “follow” and learn. Search hashtags such as #canola or #westcdnag to cut through the clutter. Use an app such as Hootsuite or Tweetdeck to organize your Twitter experience. The 4 Rs, as described by the Canadian Fertilizer Institute and other crop nutrition organizations, are the right fertilizer source at the right rate, at the right time and in the right place. The 4 Rs will help you make the most of your fertilizer investment. One goal in the Canola Council’s new strategic plan is to reach an average yield of 52 bu./ac. by 2025. This, along with acres holding at around 2012 levels, will achieve the production target of 26 million tonnes — which is the forecast market for Canadian canola by 2025.